Hi I have been experimenting with polytunnel and plastic greenhouse as thought glass gets too hot. Anyway last summer it went really well but needed lots of ventilation. To start I dug a hole under polytunnel maybe 3m long by 1m deep and 1 meter wide and filled it with layers of straw then horse manure and then sealed with fine grade compost. Just planted seeds straight into ground in early March. Well it worked. A northern light and 2 hybrids survived two heavy snowfalls and minus 10 frost. The heat generated from the horse manure was enough to defeat the cold. 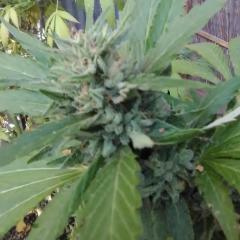 Never got anything other than dark green leaf and eventually buds. Worth the sweat and TOIL. I grew a lemon haze CBD hybrid this year and a great smoke as only 12% THC. The CBD really smooths out the head buzz when you don't want your head going like a train lol. Also have much less back pain now. Hi Cure Just wanted to say hello and I am with you Brother. Life can be cruel and harsh but being strong gets you through life. I don't have Crohn's disease but Diverticulitis which, has some simular symptoms and is a real game changer. It took 10 years to find the right Consultant to operate on me. Previous surgery did not cure me and only created more issues. I lost part of my bowel and bladder from infection. I went critical 3 times during the last surgery due to blood loss and lasted 8 hours. That was two and a half years ago and waiting for a resection to get it all running autonomously again. My Consultant saved my life for sure!! I am currently in good health but am worried disease will return. I have grown several strains so far ( northern lights and a haze/CBD hybrid) organically in a polytunnel and makes me feel good. BUT I am not sure IF these particular strains will prevent a recurrence of Diverticular Disease. I am looking for that strain. Has any strain really helped you and your family? I do know there are similarities between us with inflammation and pain. But what I have been told is with me it's the immune system breaking down that triggers a massive attack and hospitalisation and where the antibiotics just don't help. Anyway I am here to chat if it helps. Hi My first post. Can you grow proper weed in a polytunnel in Ireland? I have grown autos no trouble, northern lights and a haze hybrid. But want to grow Afgan and Haze type photoperiod plants. Ireland is far West of Europe and doesn't seem to get dark early enough before damp and cold sets in. Anyone out there with some ideas.